Suppose that your probability of winning a game is 38%, and that each game is independent of any other game. Let x = the number of games played before you win. Then x is a random variable with possible values 1,2,3,4,... . This is a geometric setting with p = .38, and the mean mx = 1/p = 1/.38 = 2.6316. The probability that x = 1 is 0.38. The probability that x = 2 is (.62)(.38) = 0.2356. The probability that x = 3 is (.62)2(.38) = 0.146072. 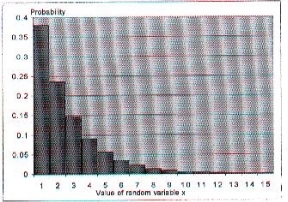 The Excel chart above displays the probability distribution of the random variable x. The table below shows probability values for x = 1,2,3,...,24,25. The probabilities of getting values greater than 25 are very small. Decimals are shown to four decimal places. Side note: It is very easy to get these values on your TI-83. Highlight list L1 and use seq(x,x,1,25,1). Highlight list L2 and use geometpdf(.38,L1). To get the product column, highlight list L3 and type L1*L2. The probability and product columns represent rounded figures calculated on a spreadsheet that did the computations using many more decimal places. This column total is, in reality, just a teensy bit short of 1. Remember that there are an infinite number of x values. This column total is the mean of the random variable x. Note that this very close to the theoretical mean obtained by using the formula 1/p = 1/.38. If you have a geometric setting, a simple formula mx = 1/p avoids all of the computation represented in the third column above.